Greetings, foolish mortals! 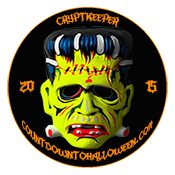 Our official 2017 Countdown to Halloween begins today. But, we want to make sure you have seen our special September post for the Universal Monsters “Monsterville” line of decor and costumes at Target. These are, hands down, the most exciting finds of the season. Today, however, we are highlighting another major retailer… Walmart. This year, their selection of scares is a bit disappointing, but there are some real treasures hidden in the eerie aisles. First, is this amazing vintage-style black cat mask. It’s backlit and glows bright. It is much larger than the traditional vacuform masks of yesteryear, but a bit smaller than the wall masks offered by Retro-a-go-go… and a lot cheaper. At less than ten bucks, it’s an absolute steal. Next, we have two very vintage figures. These items are real gems and a perfect price, coming in less than three dollars. We’ll see you in a few days with another Halloween update. Remember to stick with the Big Scare all October-long. We’ll have more fun decorations, treats, and more that you will definitely want to add to your haunted house for 2017! It wouldn’t be Halloween without the Universal Studios Monsters and the General Mills Monster Cereals. Therefore, today’s post is dedicated to these icons of the season. This year, there are a variety of Monster Cereals available. The regular releases are available at most supermarkets, while Walmart has Family-sized boxes, and Target features boxes with exclusive artwork and a premium on the back of the box. At Target, the boxes of Count Chocula, Boo-Berry, and Franken Berry all feature pieces of the Monsters’ Castle. After you collect all of the boxes, you can glue the castle together. Target is also carrying the extremely-delicious Count Chocula Treats this year. CVS is another store that has them. These are not widely available, so if you want them, get them as soon as you can. Meanwhile, World Market is offering up Universal Monsters popcorn, candy bars, lollipops, and these vintage soda flavors. The bottles feature Boris Karloff and Elsa Lanchester in their iconic roles, along with new takes on the famous slogans that appeared on the 1930s movie posters. Even if the Bride soda features the slogan from the wrong film (“It Comes to Life” is from The Mummy), it is still awfully amazing to see these characters on pop bottles. Share your World Market finds in the comments section below!